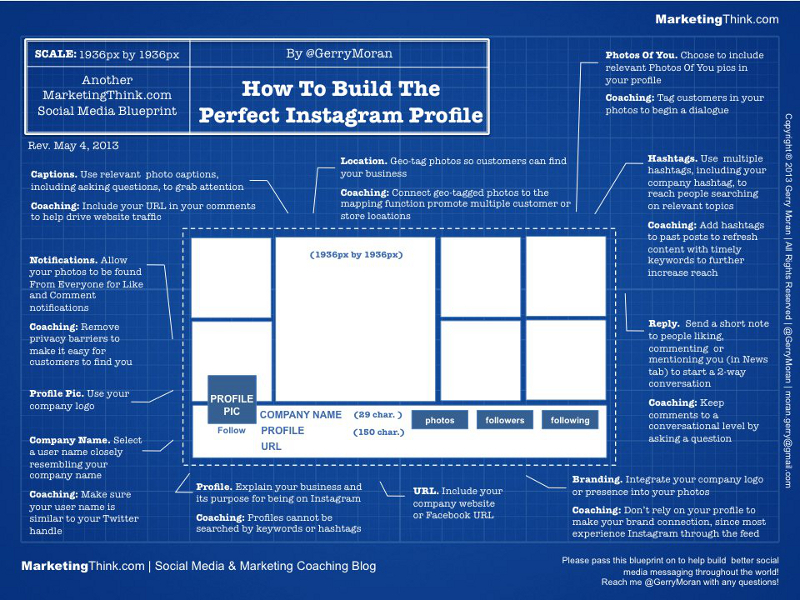 A listing of 20 tips you can use when building the perfect Instagram profile and optimizing your page. 1. Use relevant photo captions, including asking questions to grab attention. 2. Include your URL in your comments to help drive traffic to your website. 4. Remove Privacy barriers to make it easy for customers to find you. 5. Use your company logo as your profile picture. 6. Select a user name closely related to your company name. 7. Make sure your user name is similar to your Twitter handle for easy cross reference. 8. Explain your business and purpose of being on Instagram. 9. Profiles are unable to be search by keywords and hashtags so do not use them. 10. Include your company website or Facebook URL on your page. 11. Geo-tag photos so customers can find your business. 12. Connect geo-tagged photos to the mapping function to promote multiple customer or store locations. 13. Integrate your company local or presence in each photo. 14. Do not rely on your profile picture along for brand connection, since most users will experience Instagram through the feed. 15. Send a short note to thank people for linking, commenting, or mentioning your page. This will also start a two way conversation. 16. Give comments a conversational tone by asking a question. 17. Use multiple hashtags including your company hashtag to reach people when searching for relevant topics. 18. Add hashtags to past posts to refresh content with timely keywords and further increase your reach. 19. Tag customers in your photos to begin a dialogue. 20. Choose to include relevant photos of you type pictures in your profile.